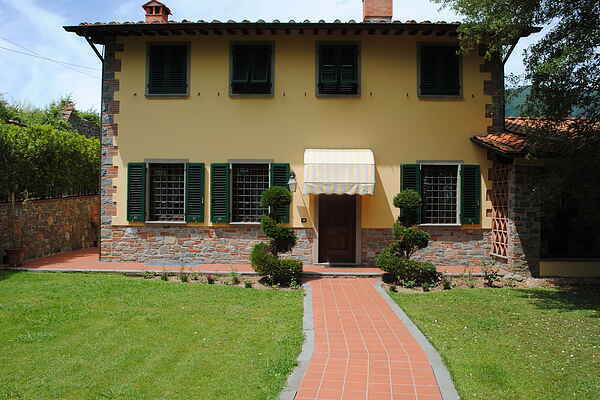 Villa Luisa, in the east of Lucca, is a wonderful restored house with all mod cons. The swimming pool is situated in a lower part of the garden. It is 12 x 6 metres and has an part to enter and a depth of 150 cm. For children it is the ultimate playing paradise and indispensable during a holiday, especially with the large garden and playing field around it. Located at the foot of the hills in the vicinity of Lucca, the garden is a true paradise. Colourful flowers, plenty of green and a warm climate ensure that the surroundings around the house are an oasis of calm. The garden is fenced off, guaranteeing complete privacy. You are welcomed here in beautiful Tuscany. In central Italy you can calm down in the wonderful nature reserves and are surrounded by the historic towns of Lucca, Pisa and Florence. The wind of the Mediterranean sea gives Tuscany a soft climate. With vast beaches nearby you can play to your heart's content with children, sunbathe or simply get a breath of fresh air. After a day's enjoyment in town, beach or the vicinity, you can enjoy culinary Italian cuisine with its renowned wines.